Veronica Lake, an actress who was very popular in the 1940s, signature style used was what is commonly called the Peek-A-Boo bang. She had little or no layers in her mostly long hairstyle (as far as we can tell), making her style unique. 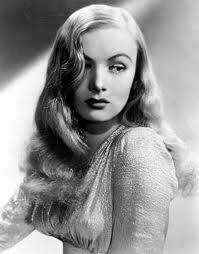 After looking at popular pictures of Veronica Lake, i noticed the straight part, hair that was mostly flat on her head then feathered out into a wave, and of course, the famous eye covering bang. This is the result of Water Waving (or Water Styling, Wet Styling, etc.). This means you do it wet wet/damp hair, most usually after a shower. NOTE: You CAN do this style if you have layers or bangs as Lisa shows us here, but if helps if you don't. This technique is a basis for lots of different vintage styles, especially if you don't have bangs(like me) and need some 'around-the-face' volume.